But one Christmas movie I truly love, and can even watch, oh, say every other year, is the 1983 Peter Billingsley classic, “A Christmas Story”. The movie, which is narrated by the story’s writer, Jean Sheppard, and inspired the great TV series “The Wonder Years”, follows the little boy Ralphie over Christmas, and his fond wish that he might find a BB Gun under the tree. He gets the gun, and it's very cute (and funny) to watch his tale unfold, but all the characters are written beautifully, and with great humor. One scene in particular, where whiny little brother Randy begins eating, sitting in his high chair in his jump suit jammies, “like a little piggy”, by instruction of his nutty Mom, gets me every time. Just that scene alone calls me in for another viewing. The role of the cantankerous yet well meaning Father is played in the movie by Darren McGavin, who passed away this week at the age of 83. He did a wonderful job in that role, his energy and general obliviousness enveloping the screen. I will forevermore remember Darren McGavin mostly as The Dad in “A Christmas Story”. May he rest in peace. At one point in the story, “The Old Man” as Darren McGavin’s character is repeatedly decribed by the narrator of the movie, wins a contest, and a side plot of the movie relates his excited wait for the marvelous prize to arrive. Not knowing what the prize is, he speculates that it is surely something wonderful, and when it arrives, in its wooden crate, his expectations have peaked. When he sees the word “FRAGILE” written on the side of the box, he is certain, in his blind enthusiasm, that it must be a foreign word, describing, in some way, the precious contents of the crate. He reads the word slowly and with great drama.......”Fra.....Jee....Lee”. Alas, the coveted and life changing prize turns out to be the ugly lamp pictured above. 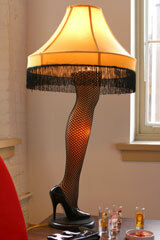 Probably due to the popularity of the movie, you can actually buy one of these lamps here. And you already know how much I love ugly lamps. The pronunciation of that word “Frajeely”, for “fragile”, stuck with me like glue, from the first time I heard it. I kept it in the little file in my brain where I keep potential song titles, and one day, not so long ago, it took on a little more life. My song “Frajeely”, appears on my 2005 CD, “Who Come Down”. The part where Marie calls me to plug her phone in for her, ( I think maybe she had the wrong battery charger), when I’m in The Can, did actually happen.